The Tribunal found that the applicant had failed to establish that he was discriminated against in any way. He was not allocated menial and demeaning job tasks, he was not disciplined, and he was not the subject of client complaints on the basis of his colour. However, the Tribunal did conclude that Herman Miller had not diligently followed up on his (unfounded) complaint that he was being discriminated against in the workplace. It also found that the Applicant’s employment was terminated in part because he had raised issues of harassment and threatened to sue the company. This was said to be an act of reprisal against the Applicant. The Tribunal awarded the applicant $55,799.70 in damages for lost wages (representing 14 months of lost wages) and $15,000 in general damages for injury to dignity, feelings and self-respect. Herman Miller Canada Inc. was also ordered to retain a human rights expert to review and revise its human rights policies and train any employee with the rank of management or higher with respect to human rights. 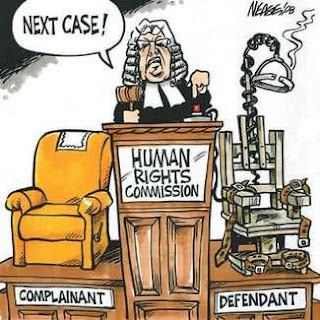 Finally, Mr. Fermo [then-President of Workplace Resources] was ordered to complete the “Human Rights 101 eLearning Module” prepared by the Ontario Human Rights Commission, even though he was no longer employed by Herman Miller Canada Inc.
Unfreakingbelievable! Why even bother going through the motions of adjudicating such cases when the "human rights" kangaroos are given free reign to render these sorts of Kafkaesque judgments? Kid Wins Spelling Contest With "Knaidel"
The Woolwich Beheading--Madness or Jihad? "Be the One to Fight Back"
File This One Under "We Are All Israelis Now"
Today in "Nothing to Do With Islam"
You Mean It's Been Okey-Dokey Up Till Now?